Kairuga is a great 2D remake of a famous shoot 'em up called Ikaruga. The basics of the gameplay revolve around dodging bullets, and changing the colour of your ship. You can be either red or blue, and if you are hit by a bullet of the same colour as yourself, you absorb it instead of being killed. Absorbing bullets increase a power meter that can be traded in for a cluster of homing missiles. The graphics in Kairuga is significantly different from the original. Aside from the obvious lack of a third demension, the sprites that replace the 3D models are very stylized. This works really well and some of the graphics look even better here than in Treasure's version. Well, at least in my opinion. However, while being different, the sprites still follow the general design of the original. The polish on the menus, splash screens, background effects and various other misc graphics are also of first rate quality, and leaves practically nothing to be desired. The gameplay is tight and can seem a bit difficult at first, even on the lower difficulty. The screen fills up with bullets pretty fast, and no matter how alert you are, you'll most likely end up having to memorize in which order and from where the enemies will show up during the level. This doesn't detract from the enjoyment of the game, though. Actually it does quite the opposite, as you feel like you've really accomplished something when you finally get to beat the first boss. But this is also where the biggest fault within the game lies; after the first level is over, so is the game. You can always go back and chain up a decent highscore, or try it on one of the tougher difficulties, but aside from more bullets, the gameplay remains the same. The music and sound effects are taken directly from the original game, and unfortunately the music is pretty boring and sounds a bit uptight. The sound effects are good though, and as a whole it works pretty well. actually spent $50 on getting Ikaruga for my GameCube, and while I thought that it was well worth the money, I have to say that I enjoyed Kairuga more. So, there you have it; if the game only was a few levels longer, I'd have been satisfied with spending a ton of money on it. However, (due to copyright reasons, I'm sure) Kairos has decided to release this gem free of charge. Free! Now go get it before he changes his mind. Note: Updated version 1.3, Final Version. 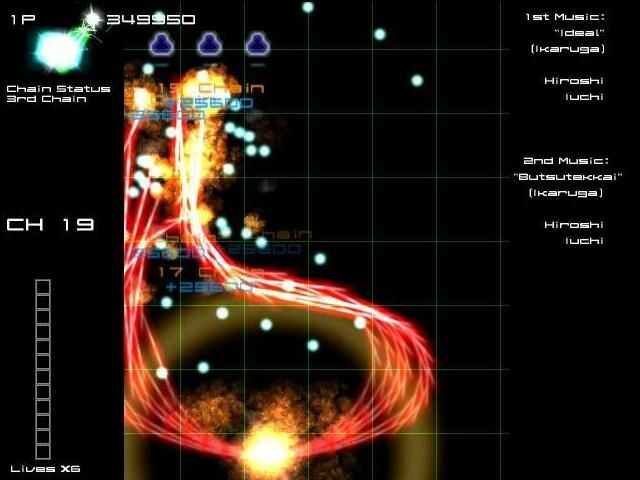 Kairuga is a mini-game tribute to the brilliant shooter, Ikaruga, and it's one-of-a-kind game play. Kairuga has similar concepts in game play, including Polarity switching, bullet absorbing, and fast action. Completely time-line driven, this game has graphics I term "False Vector", which looks like vector graphics, except tranparencies have been added, along with outline glows. You will find everything you need to know in the readme file included along with the game. Being my first game, it has received a lot of attention, as there hasn't been an Ikaruga tribute or clone that has truely kept the "spirit" of Ikaruga alive. Enjoy my first released creation. Recommendations: The 9 people who like Kairuga also like the following games. I thought the game very pretty to look at, but the gameplay was rather dull. Shooting things repeatedly is rarely fun, even when it looks cool. So while I can't say I really enjoyed the game, I was stunned by the graphical beauty, and I'm in awe of the artistic prowess of Kairos. Hopefully next time he will invest his considerable talent into a compelling game. Actually, I thought that about my game itself - although many people are casual players and don't take in everything that they can, I personally knew I could do more, but never had the time back then. There's nothing wrong with the graphics style, I know they were too stiff because animating them is more of a pain than regular sprites. But I haven't seen another GM game like such, and this was the first thing I released using this game platform. Thanks for the criticism though, but even though it's impossible to capture the feel of a 'modern' game, better something than nothing, right? Also, this was a quick mini-game more than anything, but I guess people don't judge by that sometimes. First I would like to say that I disagree with the reviewer in any point imaginable to the strongest degree. Almost. I will also not give this game a rating. It's a clone of the first level of Ikaruga, as we all know. Loved that game. But I could not have given it a top score. Because it does not come close to giving me what the original does, and there isn't more to it. The gameplay does, like in almost all clones/remakes/whatever you would want to name them, try to mimic the original, but fails at many points. A 'modern' game has so many aspects and it is impossible for one person to capture and reproduce them all. Graphics were allright. But apart from the missiles(ever heard of bm_add, people of GMG?) and such, I found them to resemble Warning Forever a bit to closely, while still being a little too stiff. Kahjah, press 'S' to change from shields to shields. The red shield blocks red bullets and the blue blocks blue bullets. Beautiful effects, nice gameplay, overall a well programmed beautiful game. 10/10. Nice game! Like I said, keep it up! Borat says: Mmmm, very nice. Will Ferrel says: Needs more cowbell/levels. VERY nice game. Beautiful graphics, gameplay. Difficult, but that's okay. Game manufacturers are making games too easy these days anyway. I'd almost give it a perfect 10, but it only has one level. The game had so much potential. It's still good, but it needs more. Oh yeah, I played this on another site. Nice, didn't know it was a gm game. Graphics are awesome good, but I think its a bit hard\fast (maybe I am too old for such upspeedgames). How did you made these great looking gloweffects? Good looking effects and sound is great too. This game has awesome graphics. As for the sound, all I hear is shooting, though I do get a fmod error when the level starts, some thing about fmod not existing and invalid parameters passed to it. When ever I push space, or other unused keys I get some other fmod errors. Why can't I get my screenshot to show? I'll look into the FMOD error, but it shouldn't be happening. Ah, sorry for 'double commenting', but I fixed the screen problem. Re_jex, I'm not sure if it's just you, because no other person has reparted an FMOD error. OI! Now I get it! You have to switch the polarity! That readme is really important! I'm uploading a new version atm, that fixes the pause button issues, but you might have FMOD problems with your comp. That's why they call it README FIRST. Download the new version when I make a note of it in the description.